A beautiful bronze tan that evenly covers all parts of the body, continues to be the fashionable trend and attribute a good summer holiday. But do not think that all girls like dark skin, some prefer her delicate pallor. Sometimes it is simply impossible to hide from sunlight, and keep the pristine whiteness of the skin. Then come to the aid of the means for removing tan. Raw potatoes grate. The resulting slurry is applied to the skin who wish to lighten. Washed off the mask after 30 minutes. She also has a nice calming effect for the skin after sunbathing. Mix into a homogeneous mass a couple of spoons of honey and a few drops of lemon and then apply it on the skin. Wait 15 minutes and then cold water to wash off the sweet mass from the body. Such procedure is repeated twice a day. To make the skin not only lighter, but give it a natural glow will help mask mix oatmeal and buttermilk. Just mix the two ingredients in equal proportions, apply the mask on body and leave for 20 minutes. Sedative effect of getting rid of sunburn will be a mixture of rose water, cucumber juice and a few drops of lemon or lime. The mask is applied for 30 minutes and then removed with water. This tool was known to Indian women, who also wanted to lighten their skin. To the milk add a pinch of turmeric and a few drops of lemon. The resulting mixture is applied to the skin, and wash off only after it dries. Sugar and lemon juice to make a wonderful homemade scrub which not only lighten the skin, but to give her more radiant. One glass of natural yogurt mixed with cucumber juice and lemon to thicken, you can use cornstarch or flour. Lasts about hour on tanned skin, and then rinse with water. Clarifier you can use aloe juice, but it is worth remembering that it makes the skin more sensitive and can cause irritation and redness with prolonged exposure to the sun. 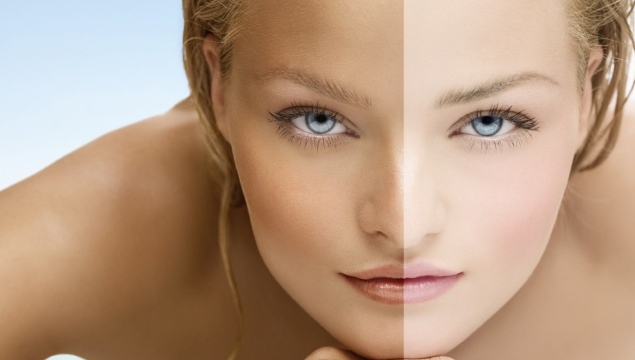 For removing tanning there are various remedies, ranging from napkins to special gloves with peeling effect. Natural way to get rid of it after taking a steam bath and treating the rough body with a loofah or scrub.